Dave Chisnall plunged to the bottom of the 2017 Betway Premier Darts League table for the second time last night (Thursday), suffering a 7-3 defeat against fellow struggler Jelle Klaasen in Brighton. 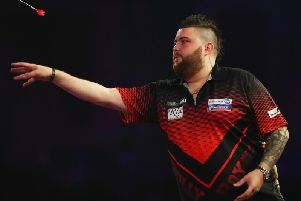 The St Helens ace never came to terms with his Dutch opponent who claimed his first win of the competition in round four following a fine display in which he averaged almost 99, hitting four 180s and finishing seven doubles from 15 attempts. “I’m happy with the win and I feel good,” said Klaasen, who moves above Chisnall on leg difference with five games remaining before the bottom two players are eliminated on Judgement Night. He added: “In the first three weeks I didn’t play badly but I missed a few chances. “I’ve since been practised a lot on my doubles - I’ve tried to go more for tops and double 16 - and it worked today. “It’s good to get away from zero points. I’m still not where I want to be, and on stage I still need to get some more confidence and I have to play a lot better to stay in the league. The Betway Premier League continues at the Westpoint Arena in Exeter next Thursday.